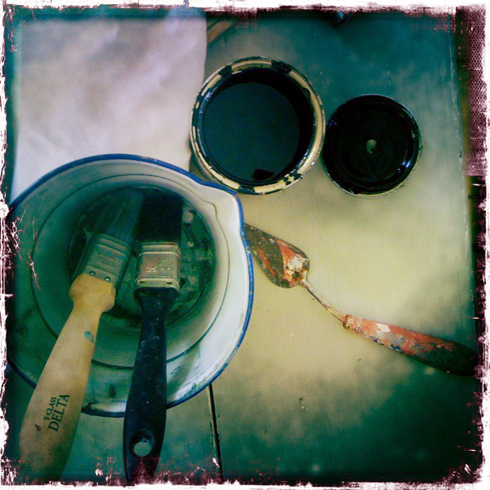 You may have noticed the blog has been a little neglected of late. This is mainly because I have head my head down, working hard and running a business. Much like the traders in the arches on Atlantic and Brixton Station Road who are currently threatened with eviction. 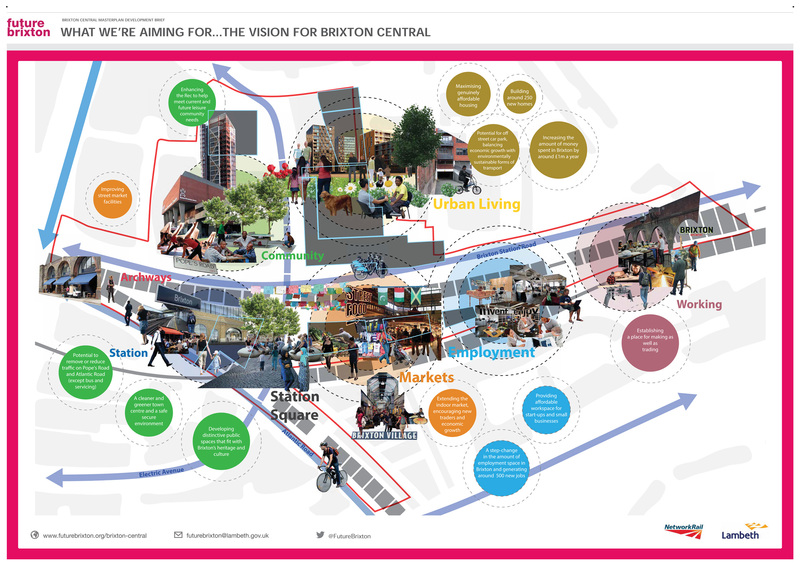 This brutal and potentially destructive move from Network Rail, no doubt encouraged by Lambeth’s ambitious Masterplan, threatens to destroy one of London’s last remaining independent business hubs – turning Brixton into another cluster of homogenised high streets in the process. 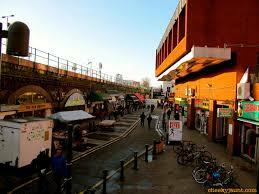 Atlantic Road and Brixton Station Road and its traders are the main arteries of Brixton. Without these arteries the heart of this unique community will stop beating. You can feel the love, effort and pride emanating from these businesses, many family-owned and dating as far back as the 1930s. Every shopkeeper has worked tirelessly to serve the local community and create the commercial destination that Brixton has now become and this is their reward? Nothing smells and sounds like walking up Brixton Station Road as the sun bounces off the Rec and the market traders set up. 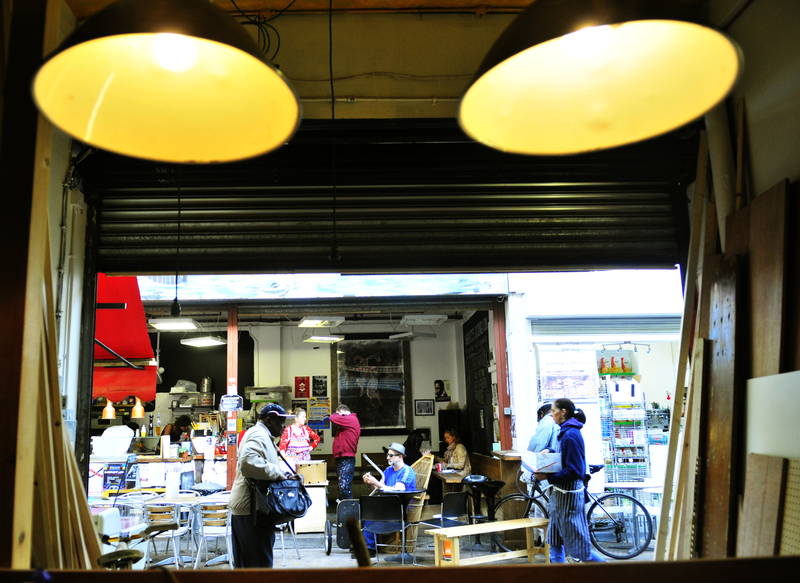 Few other shops in Brixton can match the warmth, quality and personal service of A&C, Mash & Sons or O Tahlo. Who will provide Brixton’s soundtrack if the music kiosks are booted out? These people are Brixton’s heritage and should be protected like any listed building would be*. It is gut-wrenching to see so many of these traders down-trodden and defeated in the face of their landlords callous actions. When another local institution Nour Cash & Carry was threatened with untenable rent hikes in 2013, Brixton fought to save them and they won. No community fights harder for its independent businesses and the reaction to these evictions so far has been just as impassioned. 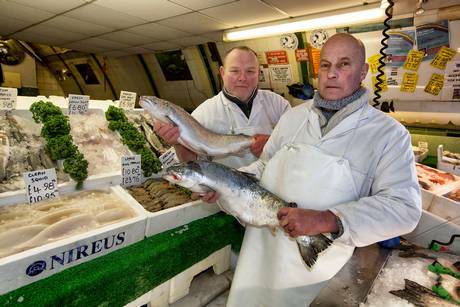 Local solicitors have been offering their services to the traders and a strong defence is building. Fellow Brixton business owner Binki Taylor summed feelings up perfectly in her letter to local councillors. 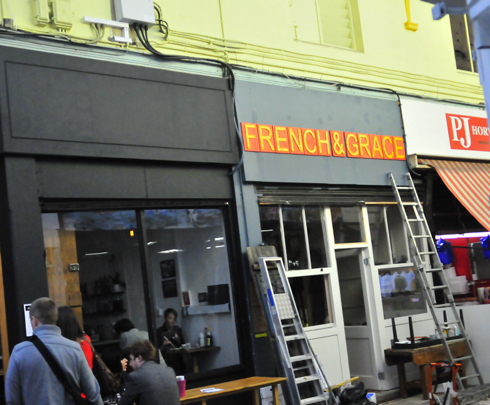 As Binki mentions, we can all appreciate the need for growth and that large chains are needed to help subsidise the rates of the smaller, independent businesses in the area, to create jobs and offer variation to Brixton’s growing consumer population. Soaring house prices have lead to an influx of wealthy, young professionals with money to burn and the landlords, of course, want to capitalise on this. However, they have acted so bluntly and insensitively on that impulse that it’s clear to see they have no understanding or appreciation of their current assets – their existing tenants. 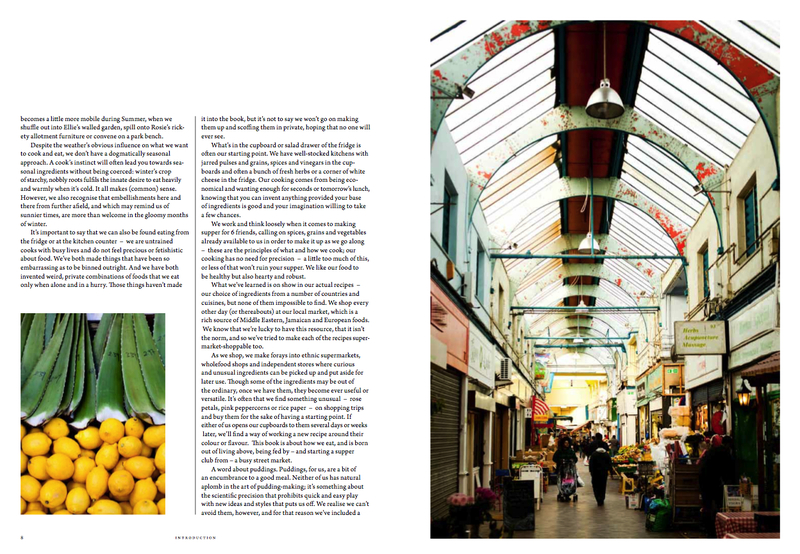 It is vital that we fight to maintain the delicate balance between the growth and preservation of Brixton before the vibrant, diverse and unique character of the neighbourhood disappears forever. Sadly the council have no direct control over National Rail’s decision, as councillor Jack Hopkins explains here, so we can only hope that they chose to react compassionately. Community is a key factor for happiness and quality of life – particularly in a city as isolating and unforgiving as London. 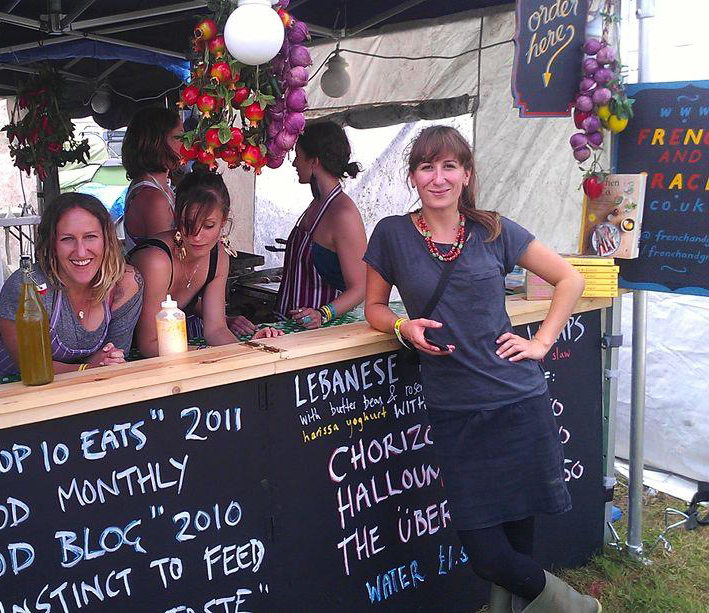 I feel extremely lucky to have been accepted into the Brixton community since our food business began here in 2009. Most mornings I lock my bike on Atlantic Road and exchange at least 5 warm, smiling hellos in the short walk to the restaurant. Soon after the news of these evictions I heard of the tragic suicide of London food blogger, photographer and fierce supporter of independent food businesses Wilkes McDermid. Wilkes, like many, didn’t enjoy being alone and found the community and interaction that he craved amongst London’s hard-working street food traders. There are so many others, like Wilkes, whose sense of belonging and purpose rely heavily upon the personal and genuine exchanges they seek within their community. National Rail’s actions threaten to destroy these everyday connections along with the livelihoods of valued, hard-working traders and their families. By all means give these businesses a chance to up their game and improve the quality of their offering in line with National Rail and Lambeth’s “vision”, but how can they be cut out altogether after such longstanding, personal investment in the area? It is a grim prospect. The only long term gain to be had here is financial for the landlords. I cannot see a gain for the community…. only the risk of a huge, irreparable loss. 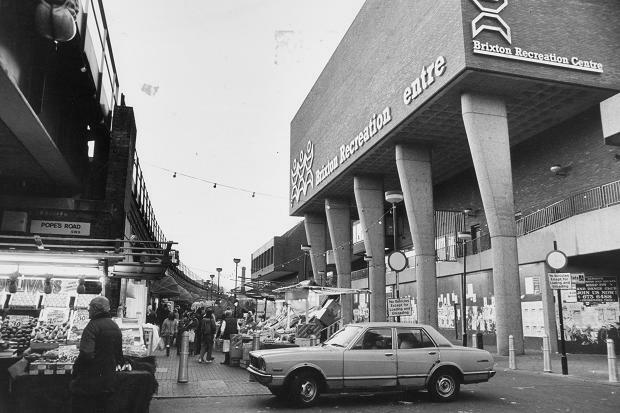 * I fear it is merely the listed status of Granville Arcade / Brixton Village and its infrastructure saving it from being demolished and rebuilt to make way for bigger business or property development. 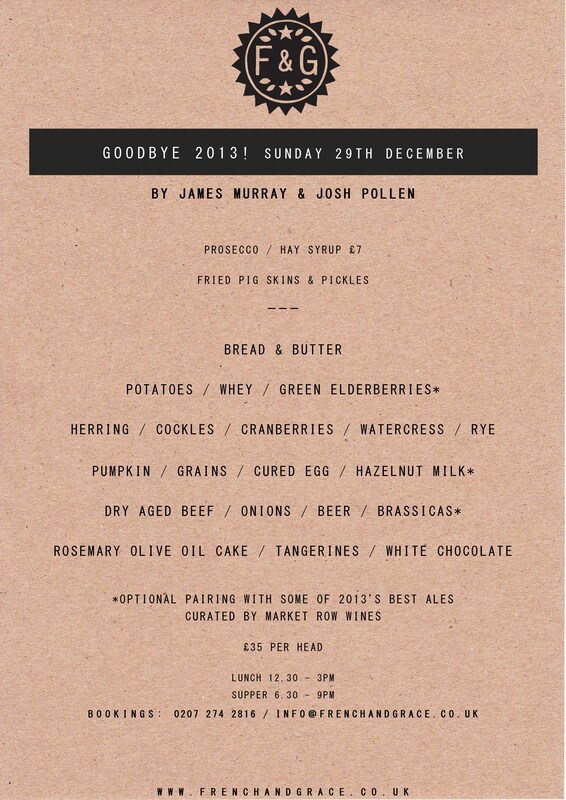 We are very excited to be handing over our Brixton kitchen to talented friends of F&G, James Murray & Josh Pollen, for a gastronomic farewell to the year gone by. James Murray has been cooking for 10 years, working his way up through the kitchens of Le Manoir, followed by stints at Texture, Claridges, Petrus & Roussillon before being invited to oversee the opening of a new restaurant in Chicago. James is currently senior sous chef at NUR in Hong Kong and we’re lucky to have the “Frying Scotsman” cooking up a storm in our kitchen while he’s back in the UK for his Christmas “break”! Collaborating with James is cook, photographer, researcher and neophile Josh Pollen, director of culinary design company Blanch & Shock. Josh has worked at Restaurant Gordon Ramsay, at Angela Hartnett’s Menu at the Connaught Hotel and he recently staged at Noma in Copenhagen alongside stints at the Nordic Food Lab. Expect some serious flavour and culinary flair from these young chefs as they bring a feast of fine-dining to our Brixton home. There will be the option of pairing certain dishes with one of the year’s most exciting ales, as selected by the lovely Dave at Market Row Wines. Seriously, how better to spend the last Sunday of the year? 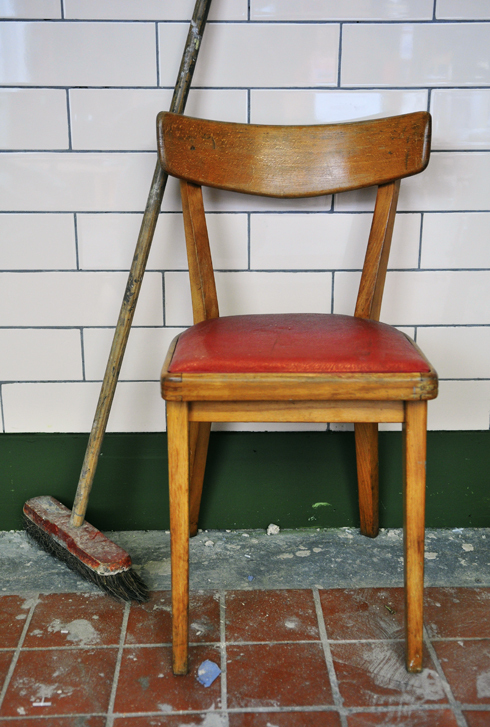 But hurry… we only have space for a single lunch and supper sitting! 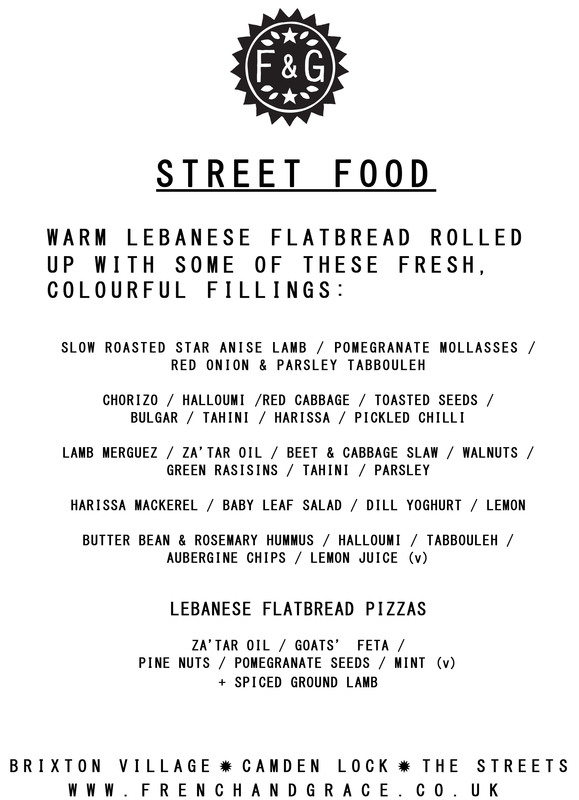 Just a quick post to keep you updated on the changes to our menus – in our Brixton restaurant (if you’re thinking of booking us out for a private party), at our Camden hatch and on our glorious, colourful street food stall. Wet your whistles with this lot! Happy Autumn one and all! We just wanted to take a moment on this here blog, where the F&G journey began, to reflect on all the amazing people who have joined our team over the years. We couldn’t do what we do without them. The growing team of F&G staff past and present have been a joy to work with and we want to thank them all for putting so much pride and energy into growing the business with us. 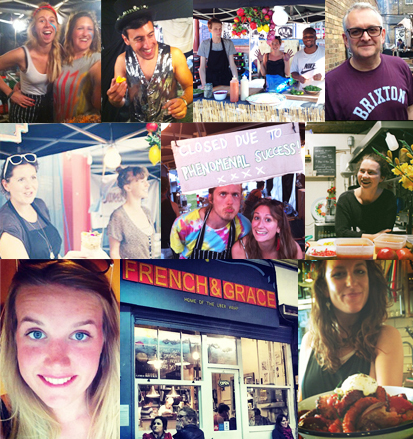 Some special shout outs go to Joss & Char for their boundless energy and loyalty in Brixton since we opened. To Maddy & Joel for always supporting the cooks and bouncing around the dining room with wide grins that never seem to droop! Dale & Phillippa, thank you for keeping it so warm and real up in Camden with those silky smooth coffees and infectious smiles. 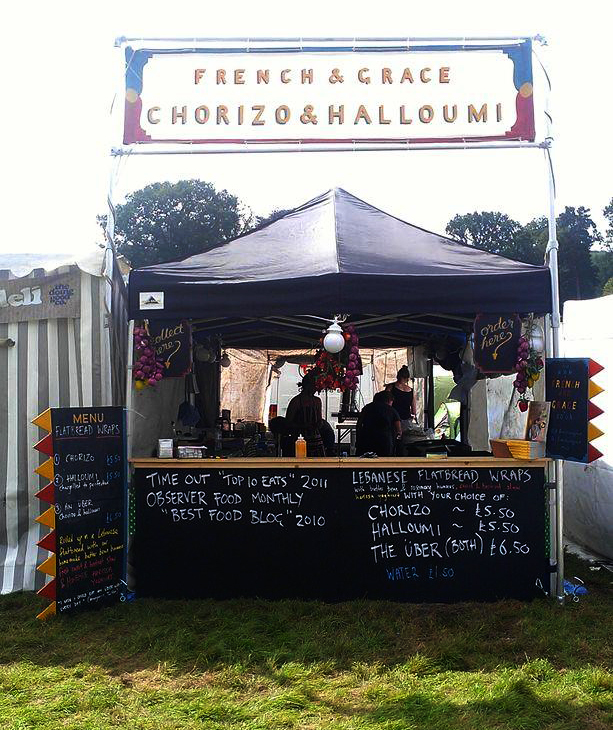 Big respect to all you griddlers and slingers who joined us for the street food Summer of Love 2013 and to everyone who has jumped on board recently – you are all fabulous. Would you like to join the team? 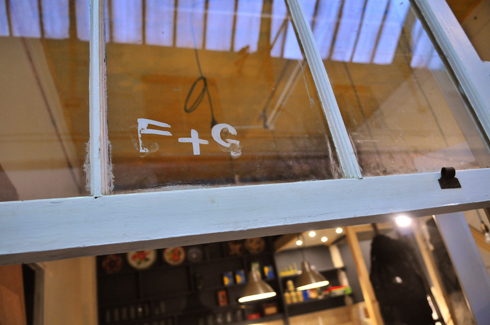 We are currently looking for an energetic and creative chef who wants to help us grow from the kitchen outwards. Ideally we require a minimum of 1 year’s experience in a busy restaurant kitchen but we’d also be interested in hearing from food stylists and cookery school graduates. Initiative and an efficient work ethic are essential. 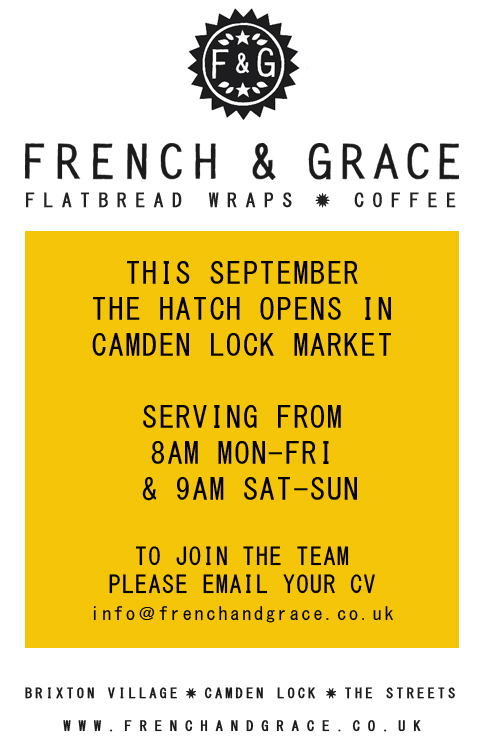 Please email info@frenchandgrace.co.uk with a covering letter and your CV to apply. Wow. That was one heck of a summer we just had back there! Now the kids are back at school, the sun is sinking ever faster and the fresh nip in the air signals the approach of Autumn. But before our thoughts turn to warming stews, soups and socks, we’d like to reflect on some highlights of an epic season. The biggest gig of our street food summer saw eight of our finest F&G ladies chugging down the M4, wipers at full speed and visibility impaired by torrential hail. 4 of us travelled in a battered 80s camper called Eric with a top speed of 45mph and the others in a truly terrible van packed to the rafters, which broke down if the speedometer crept even a millimeter over 60mph. Big respect to Annabelle for driving the beast with a smile and cracking jokes throughout! Much to our surprise, we eventually reached the beautiful foothills of Sugar Loaf Mountain for Green Man Festival 2012 – our magical muddy home for 5 crazy days in August. We slept very little, worked bloody hard and met some amazing people. Bring on next year! 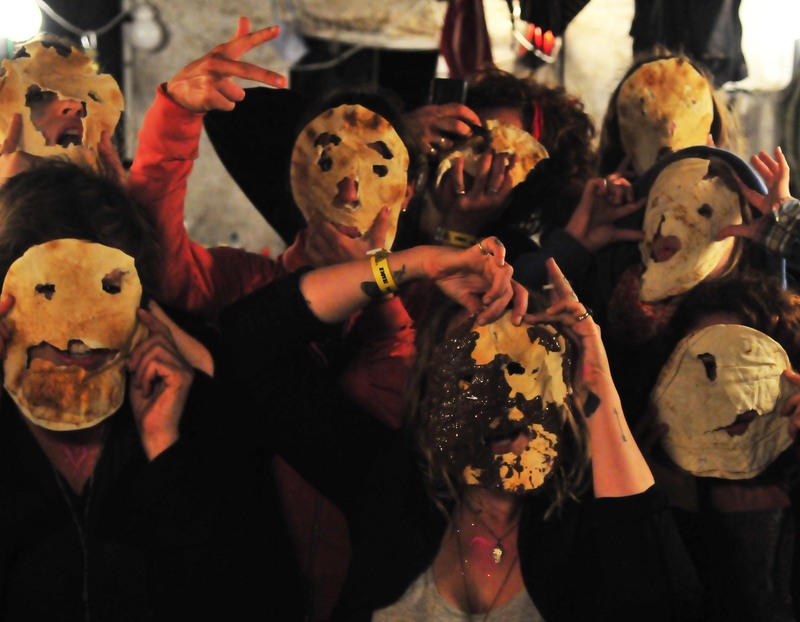 The team and their beautiful flatbread masks at the F&G Wrap Party (sometime around 2am on Monday morning). 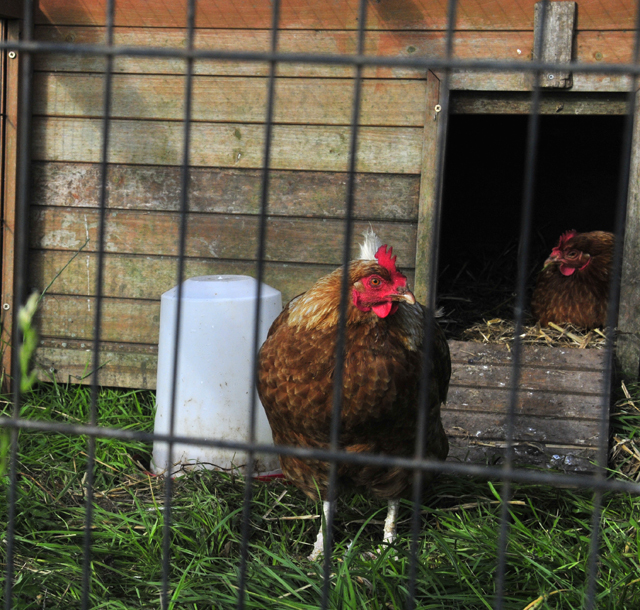 These lazy chickens didn’t lay one egg and we paid £10 to look after them. Pah! 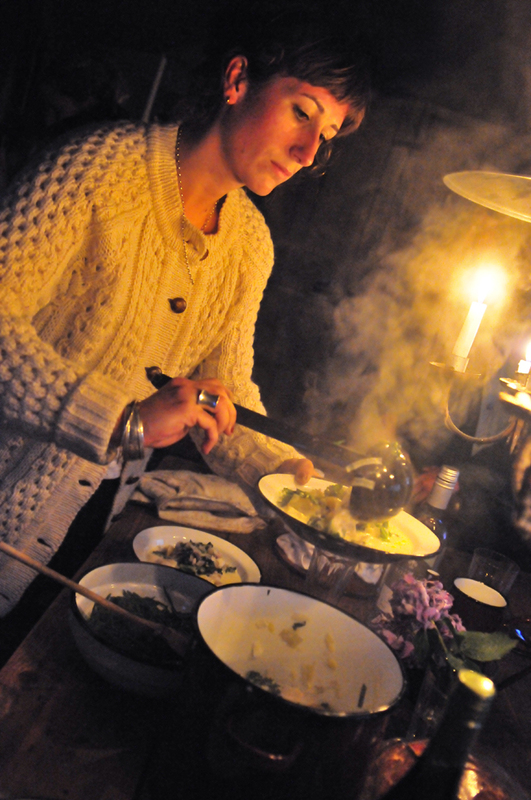 El dishing out delicious fish stew: monkfish, bream and bass fresh from Cornish seas stewed with potatoes, cream, tarragon & kale and served with generous handfuls of blanched and buttered samphire. 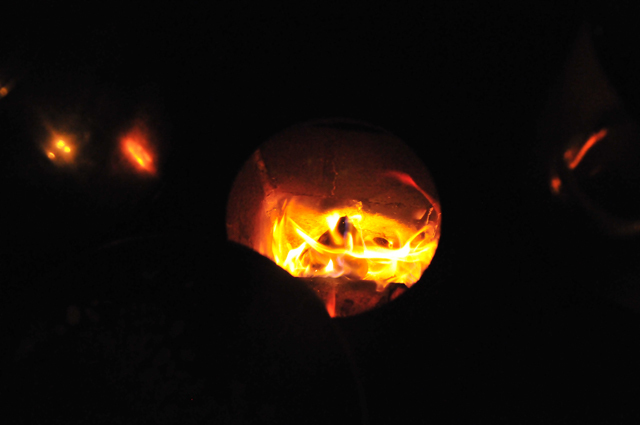 Our hob and our heating. 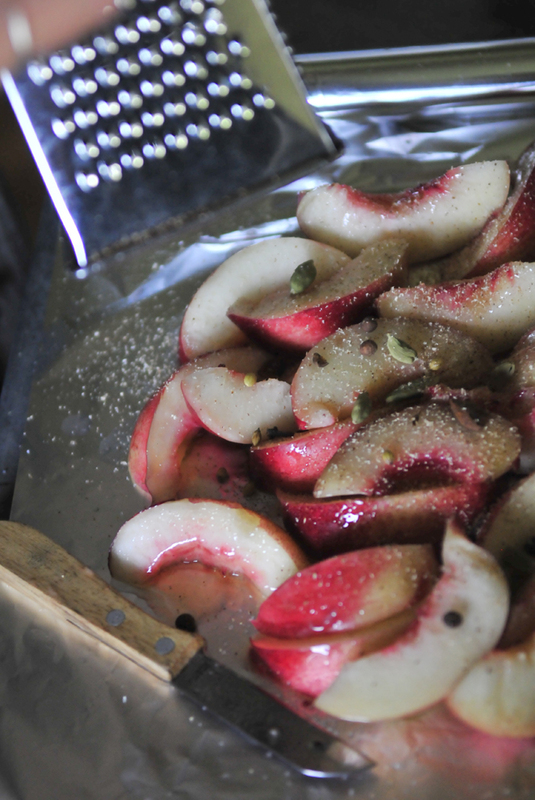 Wrap everything in foil and place the parcel in a pan over a fierce heat to soften but not turn to mush. 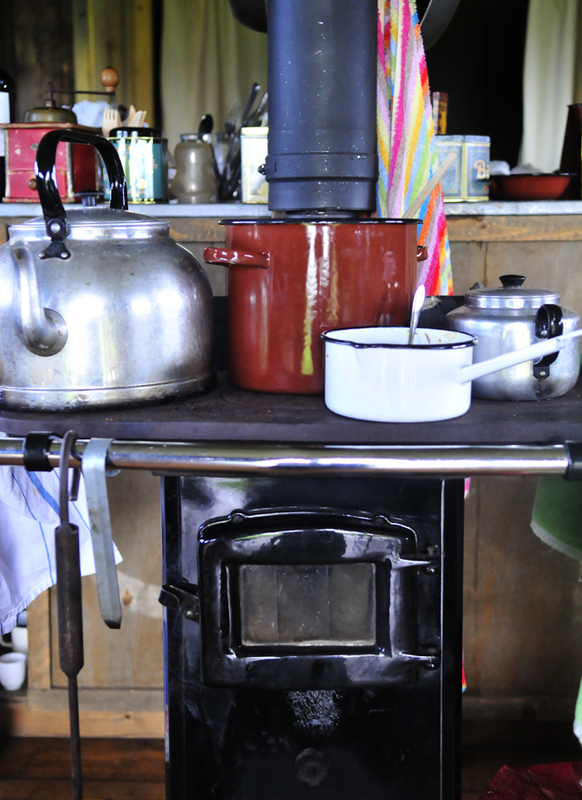 They took about 20 minutes on the wood stove but probably no more than 10 at home where you could also sling them in a hot oven. 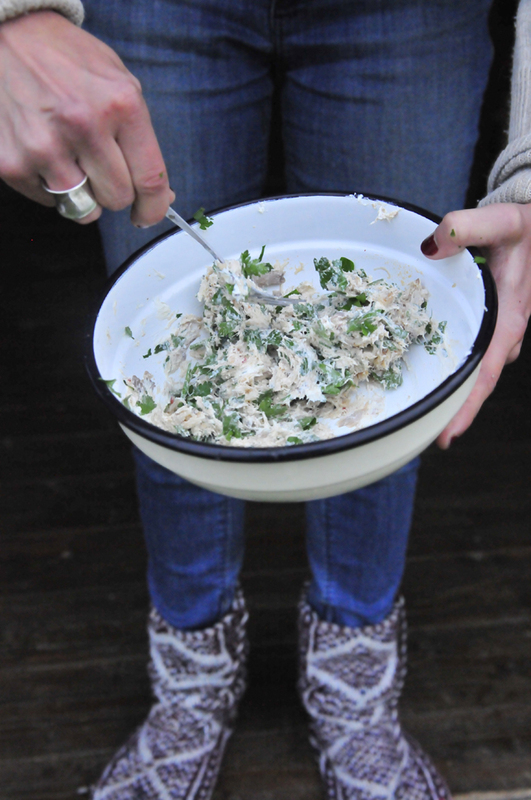 Serve with a big dollop of clotted cream and a glass of white wine. So good. 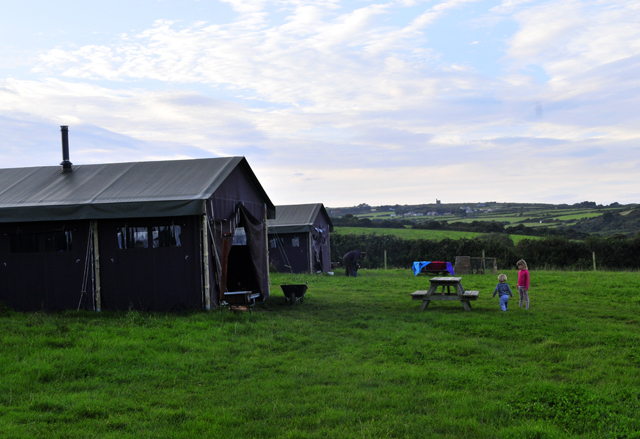 Our stay at Boswarthen Farm was truly memorable and we were the most relaxed we’ve been all year. Thank you to Voyager PR for inviting us and to Adrian and Maddy for taking such good care of us city folk! Now the weather is drawing in and our stall is hibernating in storage for a while, it’s all eyes on FRENCH & GRACE as we launch our new Autumn menu, get the heaters in and welcome some wonderful new cooks to the team. Join our mailing list here for more regular updates on the restaurant, the book, the street food and other random adventures. One of our most popular specials to date, this creamy casserole marries some of our favourite British flavours and never fails to sooth and sate the cold and hungry crowds, flocking to Brixton Village from ever further afield after the recent press deluge. Our waitresses have been asked for the recipe over many an empty bowl and it would be rude of us not to let you in on the action. Cover the knuckles in water (or better still, cider), throw in the bay leaves, fennel seeds, cloves and pepper corns, cover and bring to the boil. Simmer for 2-3 hours until the meat starts shrinking away from the bone. Drain, leave until cool enough to handle and shred the meat, discarding any fat or gristle along the way. Set the shredded hock aside for later. Pour a long glug of olive oil into a large saucepan over a medium heat, add the onions, a pinch of fennel seeds, the sliced cabbage, thyme leaves and nutmeg and stir until everything is soft and pale. Add the garlic and white wine vinegar and stir for a few minutes before pouring in the stock. Bring slowly to the boil, stir in the mustard and beans and leave to simmer for 5 minutes before adding the shredded ham hock and kale. Simmer for another 5 minutes and then remove from the heat, stir in the cream and give everything a generous going over with the pepper mill. Taste and add more nutmeg/mustard/seasoning to taste. Serve with toasted sourdough, caperberries and a drizzle of olive oil. 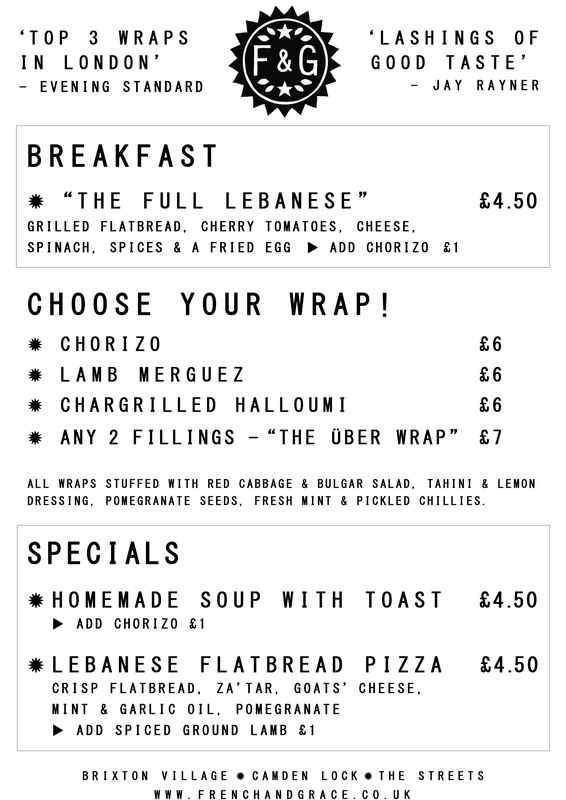 That’s right, two of our mighty wraps (lamb merguez or halloumi) for a tenner. 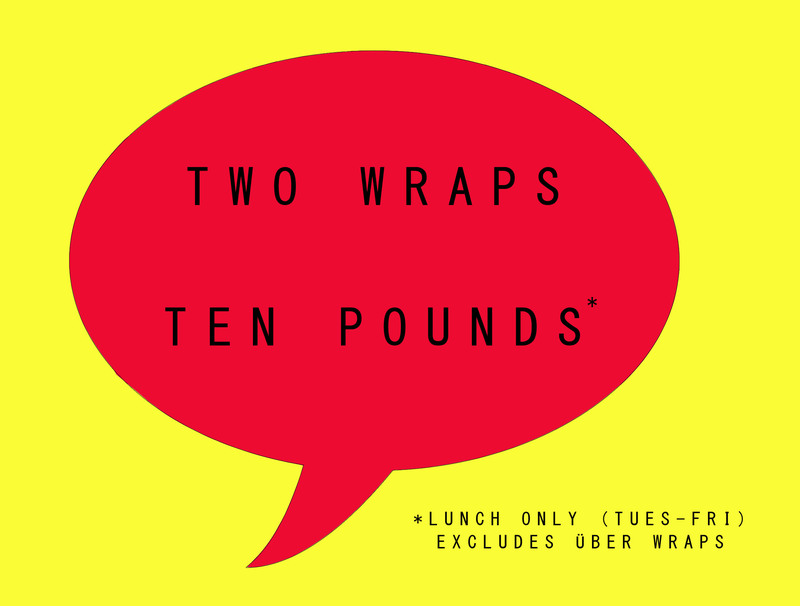 Not only that but each wrap earns you a stamp on your F&G loyalty card and the tenth is on us. Now that’s generous and, if you live, work or waste your time in Brixton during the week it makes total sense. In other exciting restaurant news, from March 16th we will be staying open until 11pm so we won’t have to decant you and your wine out onto the streets of Brixton before you’ve asked for the bill! 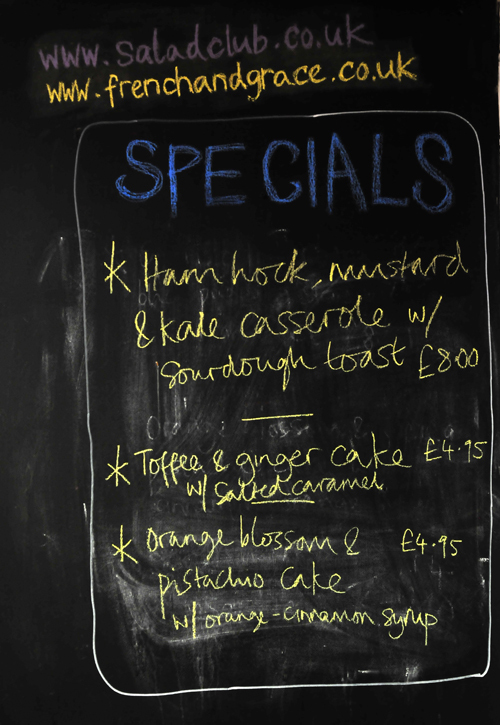 You might even have time to for a coffee and one of those amazing puddings from the blackboard photo up there. 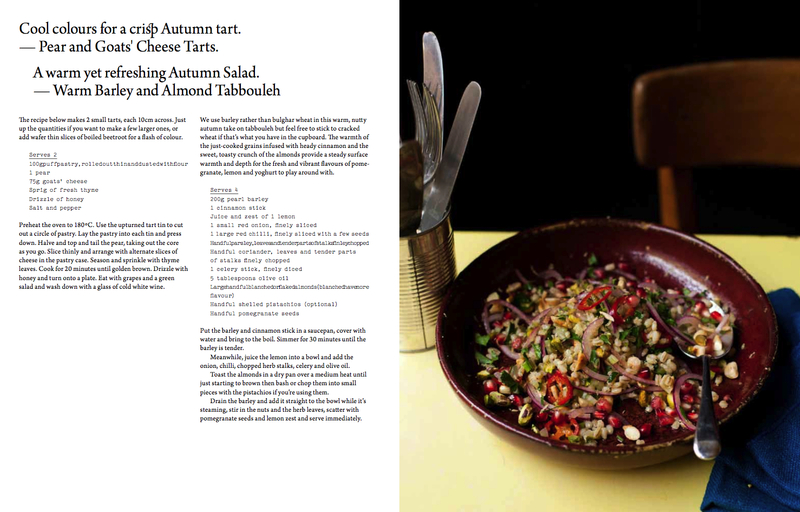 We’re so pleased with the look and feel of every page – it truly feels like our book and we really hope you like it too. 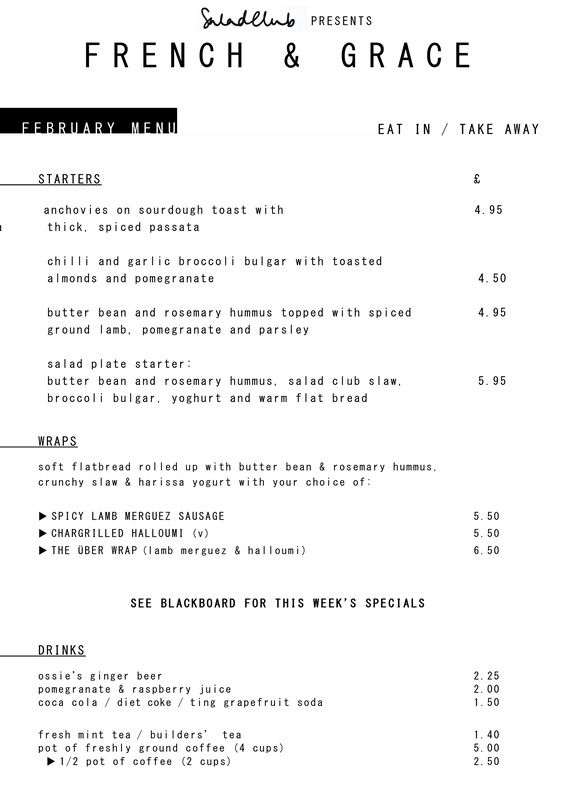 Well that lot should fill you up for now and we’ll be back shortly with news of our Spring menu and other exciting changes at F&G, plus more recipes of course and no doubt a bit of profound moaning and astute weather analysis! See you soon. Kind of Beckettian, but without the mud. If that internal monologue doesn’t do the feeling justice, I distinctly recall every single morning feeling as though I’d been clobbered round the head with a bottle of vodka in the minutes between collapsing in bed and waking to the ringing of the alarm clock. It didn’t help that we were driven to drink through the latter parts of 13 hour shifts – which ran back to back for 4 days, every week – but drink or no drink, it was hard, hard work. And it still is. It’s required everything of our joined mental faculties to keep on top of the orders, the staff, the cooking, the cleaning, the logging of fridge temperatures (it’s glamorous.) Those who saw us at the start witnessed the un-pretty, deeply etched bags from under our eyes which have just about lifted, and I’m sure they’d be kind and comment on the running of the place feeling more smooth. We must be kind on oursleves too, and enjoy the progress along with the journey. Not only that but we’ve started to claim back wedges of the social lives we had stolen from us in October and that too feels good. Slowly, carefully, we are finding what is called ‘a balance’, and this, after all, is half the point of being self-employed. This week, however, Britain is experiencing a cold snap and we have no customers. 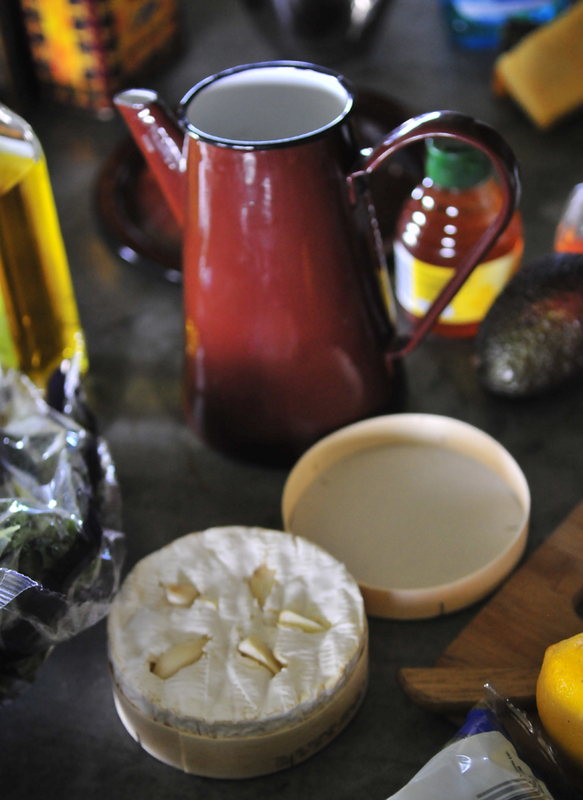 It’s so cold in the mornings that the oven goes on – door open – to heat the room up and loosen the solid bottle of olive oil from Brixton’s arctic grip. Stamping around with nine layers and several cups of tea, the morning prep and shopping trip gets underway. And then I wait. And in come some staff. And we wait together. 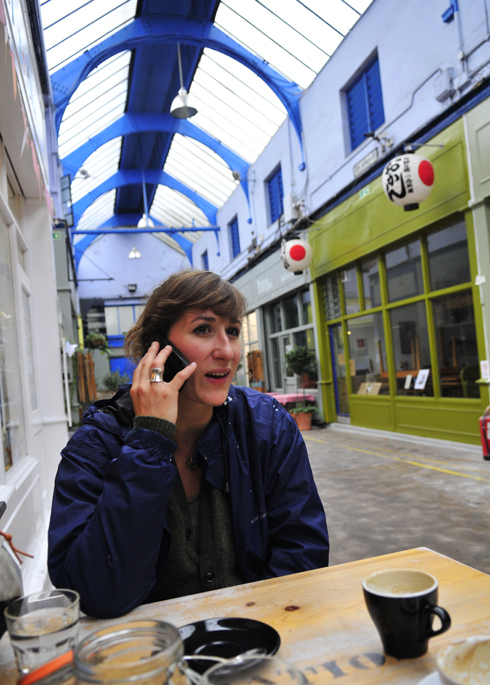 We serve a handful of brave local workers who manage to take off their coats and relax over bowls of hot specials and mugs of tea. But then they go, and we remain. It’s a bit of a shock, having enjoyed the surprisingly fruitful weeks of a busy January. 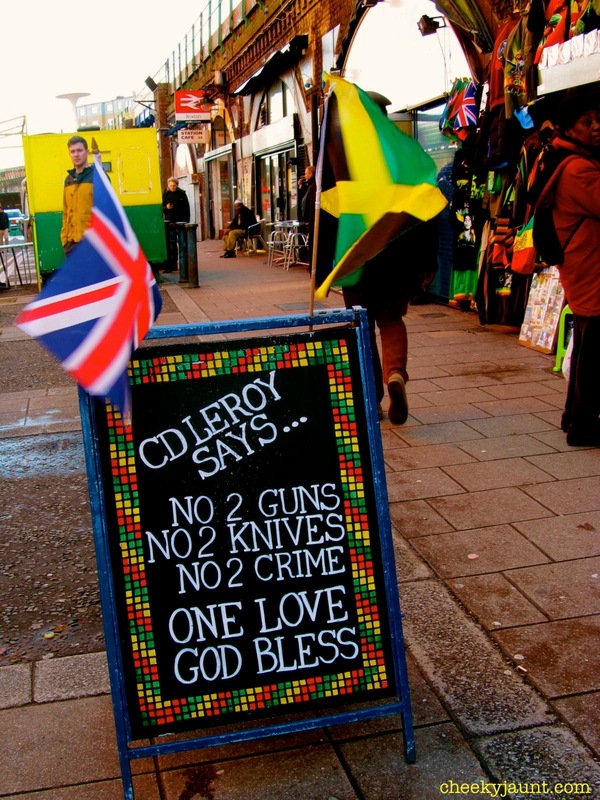 But then that’s business, and quite specifically, Brixton Village. Come the warmer winds, our customers will quite rightly return. 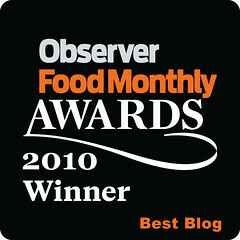 Anyway, the point of all this is that it’s been quiet of late and we’ve missed the blog. 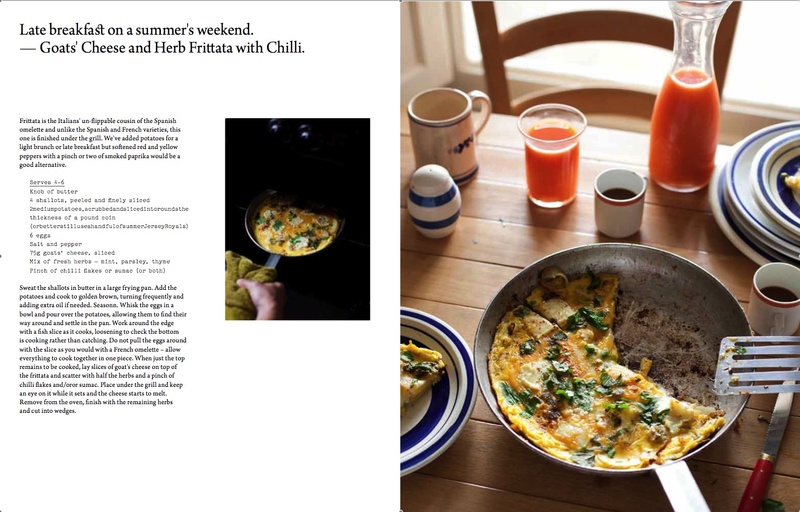 We finally have a chance to say something during this period of chilly reflection and we would like to state that it’s our aim to really get back to writing this year and to make time to upload, photograph and share some new recipes – maybe even some from the book?! 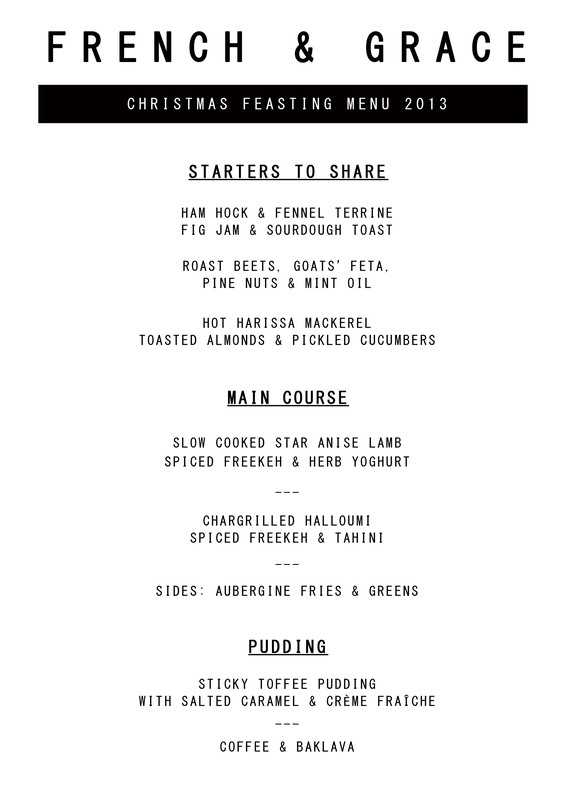 For now, though, here’s a snapshot of what we’re doing this month at F&G, in a bid to lure you down for a tasty lunch with us. Come on in – the oven’s on! Today marks our first day off for weeks so this shan’t be too lengthy a post. 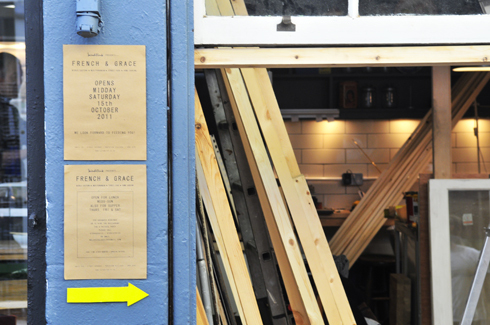 We just wanted to thank you all for your patience and support while we’ve been absorbed in the crazy business of setting up FRENCH & GRACE. Designing and building a beautiful, functional restaurant in a run-down arcade, with only 191 square feet to play with, has been a challenging, exhausting and exhilarating experience, to say the least. The process has aged us prematurely, ruined our hands, killed our social life and stopped us sleeping but, as we open the shutters to the restaurant we’ve dreamed about for years, we could not be prouder. We’re looking forward to staying still for a while and getting back to our duties of cooking and sharing recipes here on the blog where the journey began. 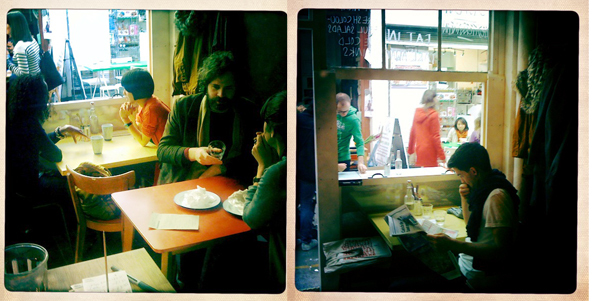 People came, people cleared their plates and licked their lips, people read the papers and people said thank you. This made us happy! See you soon. * We needed a little longer than we anticipated to get everything just right and will open to the public on Saturday 15th at Midday. See FRENCH & GRACE for more details. We’re excited and scared all at once, and so very, very thrilled to be able to put down some roots in a space that we’ve watched and thoroughly enjoyed as it’s grown over the last two years. 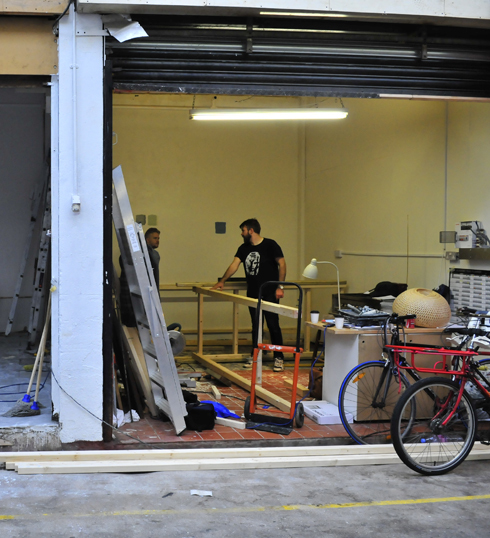 It wasn’t all that long ago that we hosted a day and night’s residency at Cornercopia, just round the corner, and we longed for a shop of our own. So now we have one! 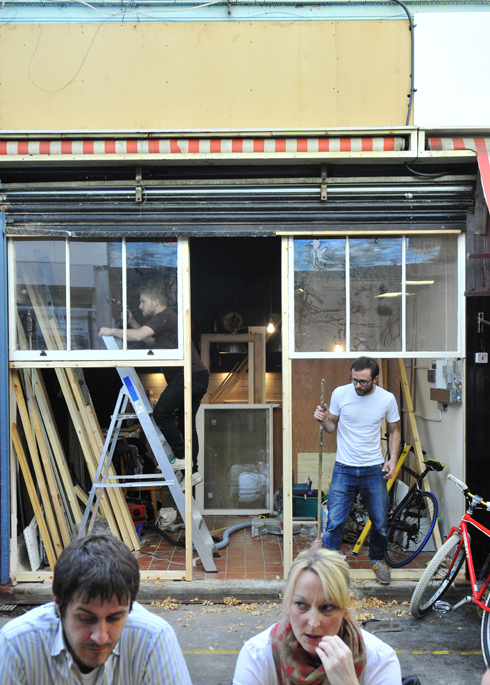 We fought tooth and nail with our proposal to get in there, and we’re well under way with the build. Watching the tiny, dark red butcher’s shop that it used to be becoming a Salad Club hangout and kitchen-restaurant on a miniature scale (believe, it’s 191 compact square feet) is a beautiful thing. We have anguished over paint colours, tiling, floor coverings, suppliers, refrigeration systems, you name it. And no, we’re not quite there yet – there is a great deal of work to be completed still, but we’re on our way, and it feels darn good. No longer will we have to ferry pots and measuring jugs between our kitchens. We have a shared, loved workspace to cycle to in the mornings where we’ll pull up the shutter, get the coffee on the hob, and attend to our daily cooking, ready to share with you, the people we’ve allowed to go hungry for too, too long. 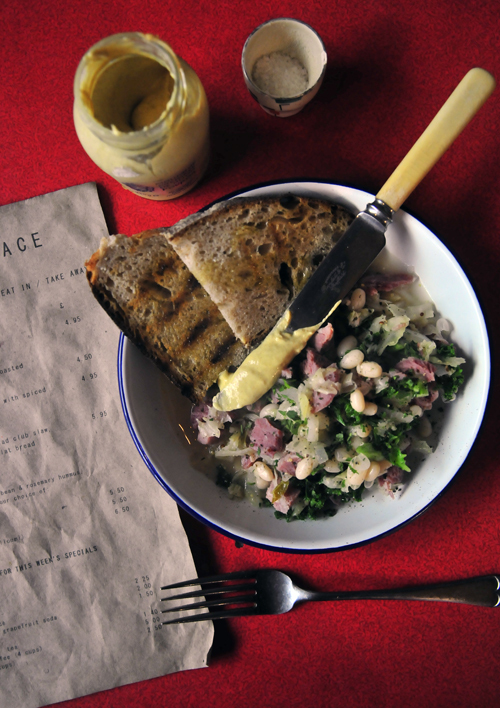 We look forward to serving up our hearty, colourful Salad Club style street food and home cooking, and will be open for take aways, supper bookings and all sorts in between. So now you see we weren’t ignoring you, we just had a lot of projects to hurl oursleves into. 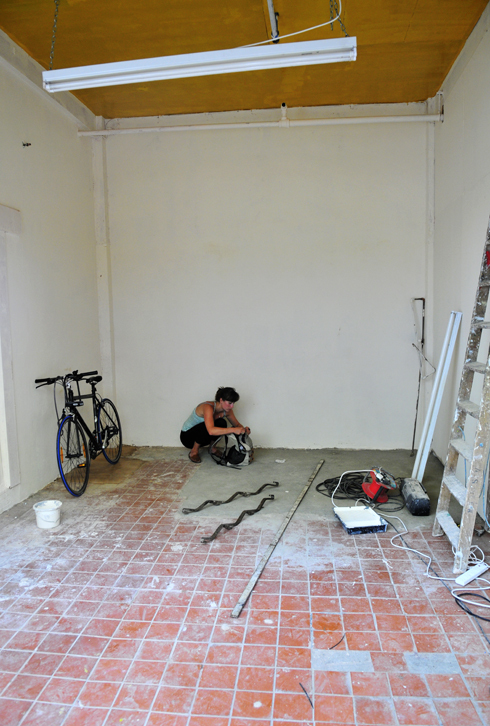 We’ve had enormous help from several great groups of people whom we’d like to thank: namely Raph, Rosie’s husband, who has been on his knees with a hammer and saw these last few weeks, advising, measuring and building the thing. Then there’s the unforgettable assistance and support of The Princes’ Trust who’ve helped us onto our business feet with a whole wealth of sensible, practical courses and spreadsheets. We face their Dragon’s Den approval committee on Monday to see if we can bother them for a loan – Deborah Meaden, here we come! So yeah, we’ve built up an appetite too. As of today, OUR FINAL BOOK DEADLINE (ach! 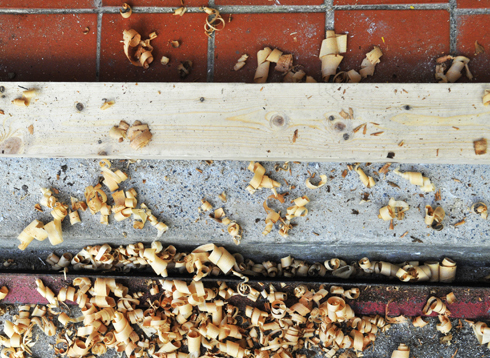 ), we may just be able to carve out some time to start posting blogs again. We’ll be nipping off throughout September to rear our heads on the festival scene first (West Norwood Feast, Alex James Presents Harvest, Abergavenny and Real Food Harvest Festival) and then we’ll be right back with you, ready to open up the shop, and in one place for once. Sort of. After that, we’d really appreciate it if you could sort us out with a holiday, yeah? Please enquire about private dining. 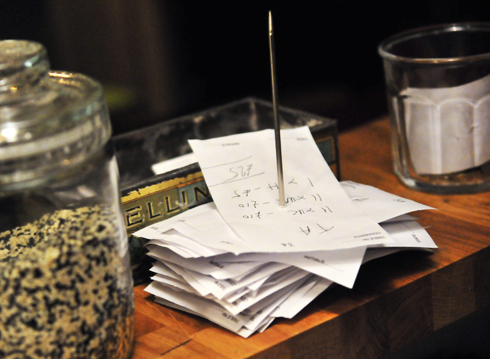 We organise everything from personalised menus and ingredient sourcing to suit your budget, through to table laying and washing up. We are also available for one-off projects and collaborations.